WASHINGTON, DC, March 21, 2012 (ENS) – More than a million citizens signed an emergency legal petition filed with the U.S. EPA today seeking suspension of use of a pesticide linked to honey bee deaths. The pesticide clothianidin is harmful to honey bees, say the commercial beekeepers and environmental organizations that are responsible for the petition. Bees have been under enormous stress anyway, since colony collapse disorder began wiping out hives in 2006. The legal petition details how the EPA failed to follow its own regulations when it came to clothianidin. EPA granted conditional registration to clothianidin in 2003. The conditional registration was contingent upon the subsequent submission of an acceptable field study showing no “unreasonable adverse effects” on pollinators. This requirement has not been met. In the years since, a substantial body of scientific evidence has confirmed that clothianidin, in fact, presents serious risks to honey bees. Over two dozen beekeepers filed the legal petition with EPA. They are concerned about the impacts on their beekeeping operations, which are already in jeopardy. “The future of beekeeping faces numerous threats, including from clothianidin, and we need to take steps to protect pollinators and the livelihood of beekeepers,” said Steve Ellis of Old Mill Honey Co. and a co-petitioner. “Independent research links pollinator declines, especially honey bees, to a wide range of problems with industrial agriculture, especially pesticides,” said co-petitioner John Kepner, program director at Beyond Pesticides. Clothianidin is an alternative to organophosphate, carbamate, and pyrethroid pesticides. It poses lower risks to mammals, including humans, when compared to organophosphates and carbamates. It has helped prevent insect pests build up resistance to organophosphate and pyrethroid pesticides. 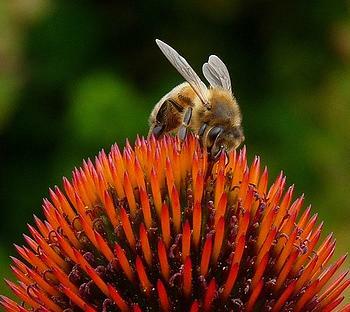 But honey bees appear to be paying a high price for the use of clothianidin, classed as a neonicotinoid. Clothianidin works its way up into the flowers and leaves residues in the nectar and pollen, which are eaten by young, developing bees. The scientists studying colony collapse disorder have tested samples of pollen and have indicated findings of a broad range of substances, including insecticides, fungicides, and herbicides. These scientists note that the doses taken up by bees are not lethal, but they are concerned about possible chronic problems caused by long-term exposure. As noted by the National Research Council, some studies report sublethal effects of pesticides on bee foraging behavior that may impair the navigational and foraging abilities of honey bees. Scientists have worried for years that pesticides may have sub-lethal effects on bees, not killing them but impairing their development and behavior.